The Vikings defense gang tackle an Elko rusher. 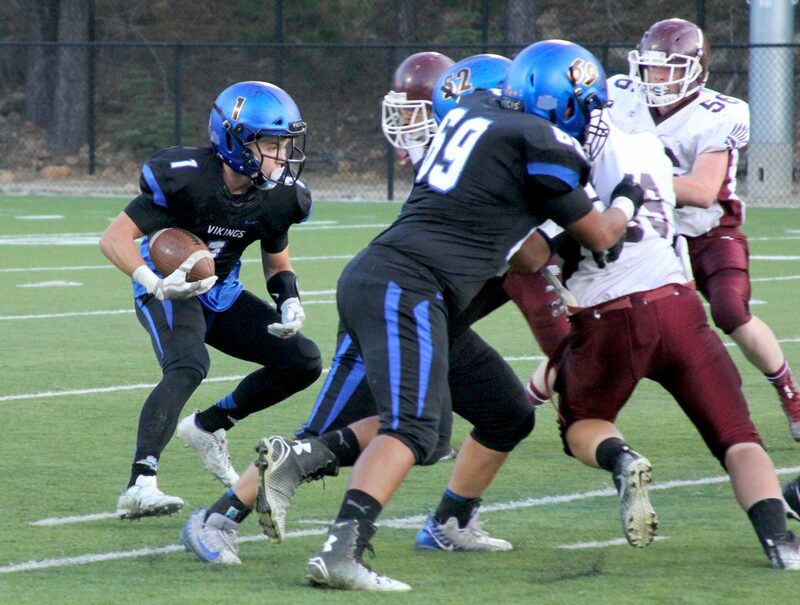 South Tahoe's James Knudsen looks for running room behind the offensive line. 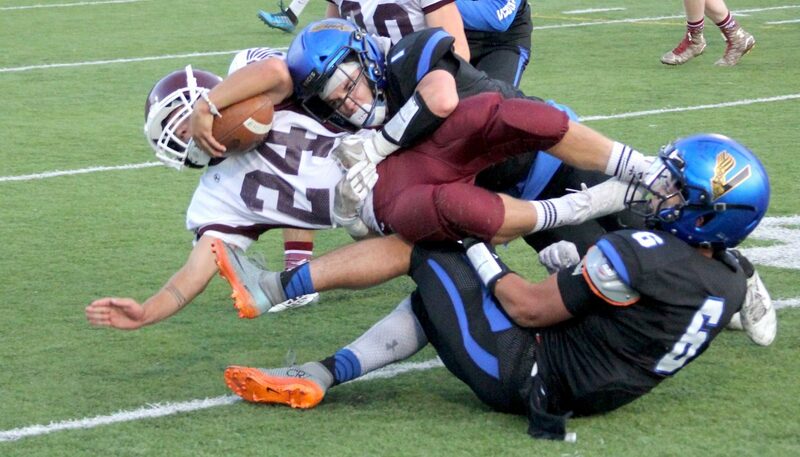 South Tahoe's James Knudsen (1) and Gio Medina Morales (6) team up to tackle an Elko running back. 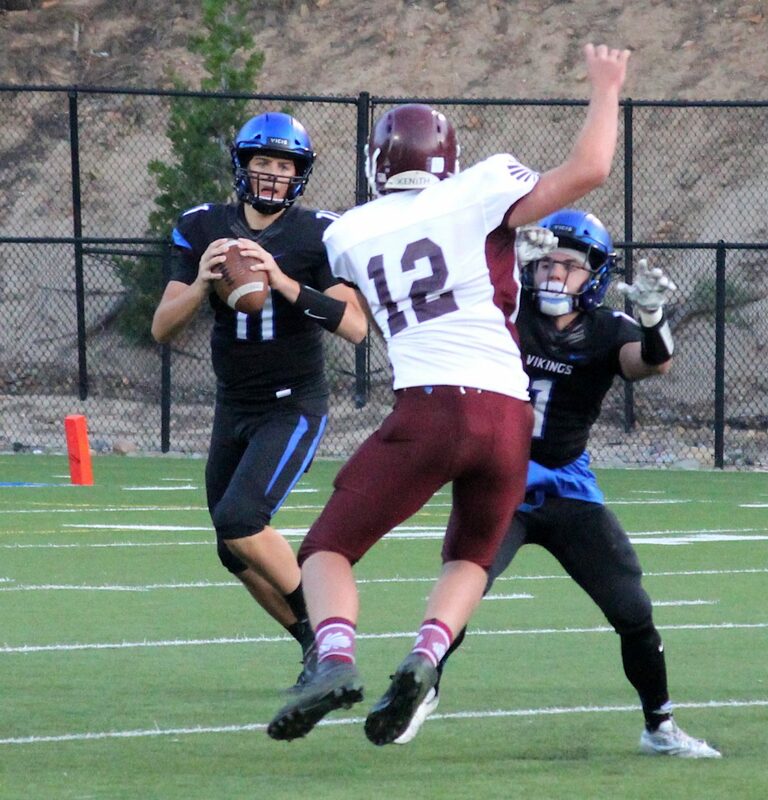 South Tahoe quarterback Jake Tarwater gets blocking help from running back James Knudsen. 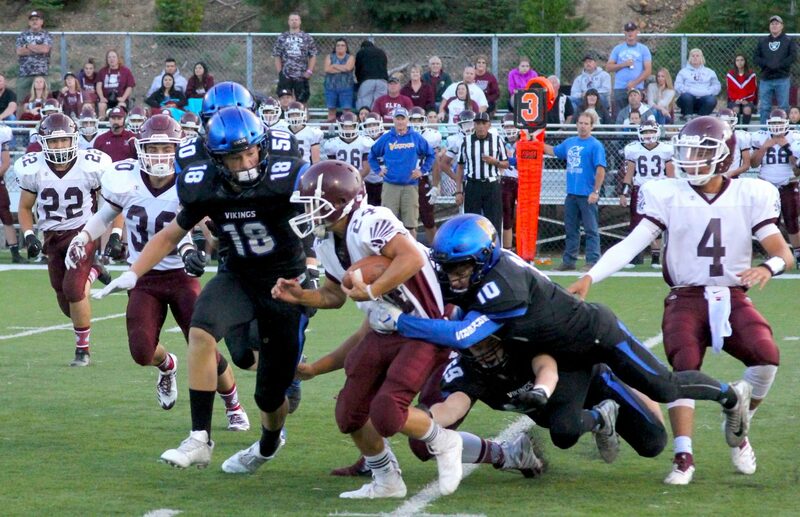 The South Tahoe defense gang tackles and Elko ball carrier. South Tahoe's Kody Griffis tip-toes downtime sideline for a few more yards after making a reception and ditching a tackle attempt. 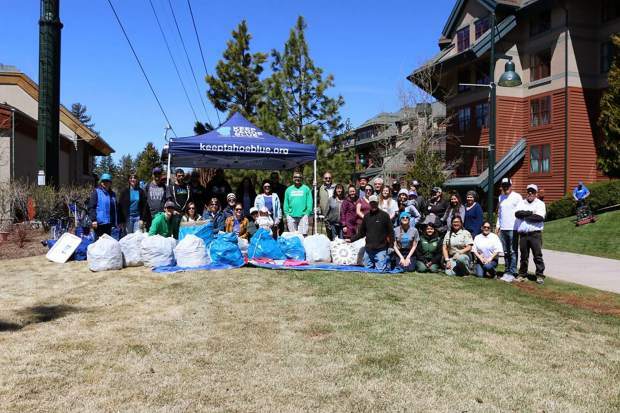 SOUTH LAKE TAHOE, Calif. — Having a career night didn’t matter to Kody Griffis because it came in defeat. 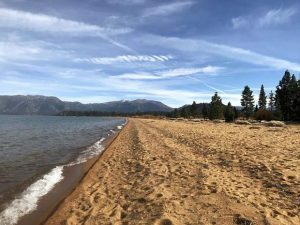 The South Tahoe senior didn’t care to chat much about recording career highs in receptions and yards, but was ready to get back to work with his teammates. 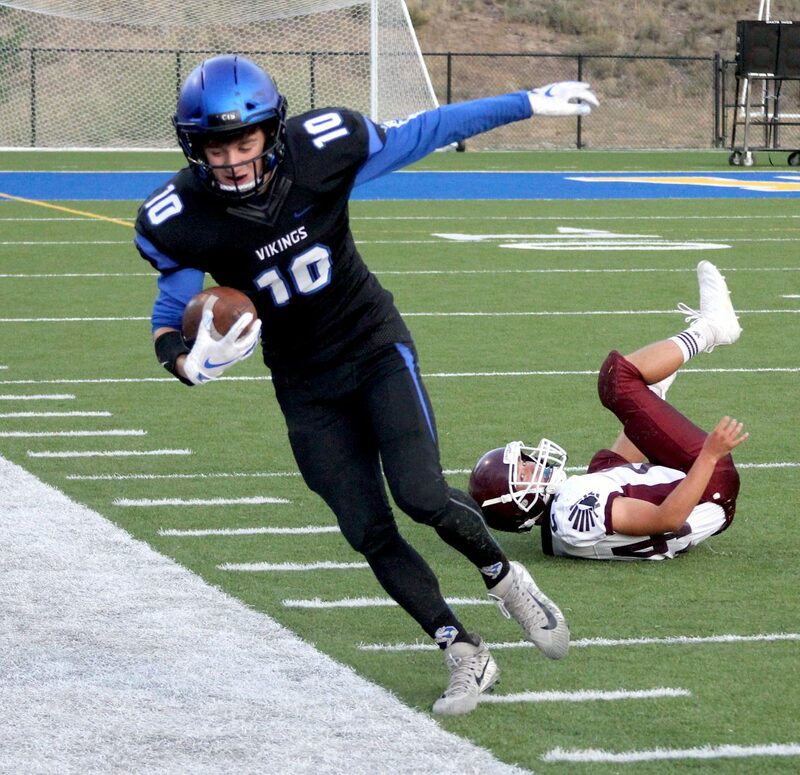 Griffis made 14 receptions for 247 yards and caught sophomore Jake Tarwater’s first two varsity touchdown passes Friday night, but the Vikings lost 26-14 to the Elko Indians. Griffis made 10 second-half receptions and eclipsed his total catches and yards he accumulated as a junior (13 for 140). A nearly full moon peaked over the horizon during halftime and seemed to help bring out the animal in the home team to start the second half. Trailing 13-0 after not gaining a heck of a lot of yards in the first 24 minutes aside from one drive that ended with a missed field goal, the Vikings offense came out swinging in the third quarter. Tarwater hit Griffis for 10 yards and followed with another pass to Griffis that the duo will like watching on video replay. The big righty rolled to his left and lofted a pass deep down the sideline that Griffis hauled in for a 41-yard gain. Two plays later, Tarwater connected with Griffis on a 24-yard score to make it 13-7. The South Tahoe sideline erupted in celebration of the team’s first touchdown this season. The energy following the touchdown gave the Vikings defense boost. It stifled the Indians with a three-and-out, including a sack by James Knudsen. 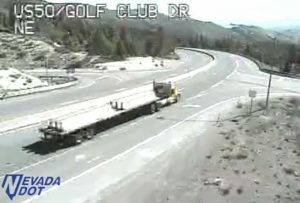 South Tahoe followed by driving 35 yards to the Elko 24 before turning it over. The Vikings defense again forced a punt. Two plays later South Tahoe looked like it had tied the game. 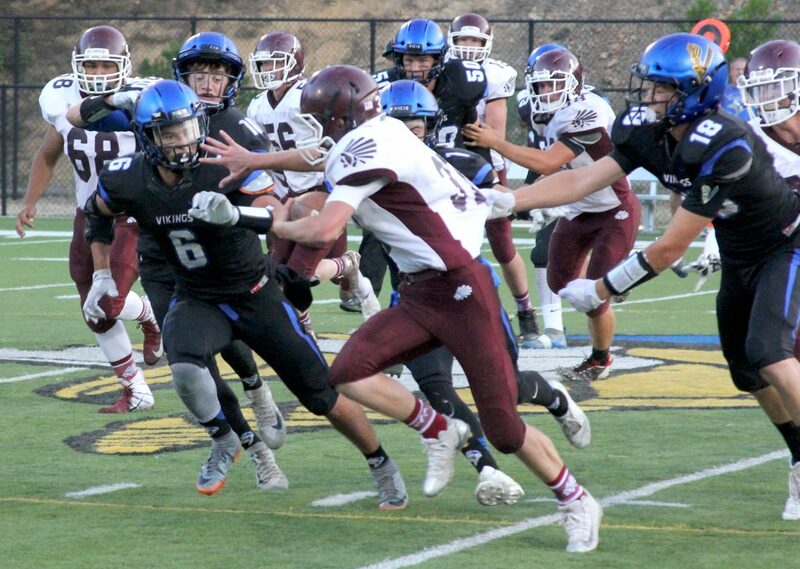 Knudsen took a handoff and sprinted and weaved his way through Elko defenders 63 yards for a touchdown. It took awhile for the players on the Viking bench to see the yellow flag at about midfield that would bring the play back — they were screaming and running down the sideline admiring the effort. The drive ultimately ended with a turnover deep in Elko territory. That was the second half theme, march, march, march down the field and turn it over. The defense continued to keep the Vikings close. Austin Rhodes made four tackles for loss, including a sack, on the night and Knudsen also had a sack. Franklin loved the way those guys played as well as others. After the Vikings drove inside Elko’s 10 and turned it over for the third time in the half, it was one turnover too many. Elko’s Cooper Jones broke South Tahoe’s spirit with a 93-yard scoring run to make it 19-7 with 4:26 left in the game. Elko scored its final touchdown two plays later converting South Tahoe’s fourth turnover into a defensive score. The Vikings final score was a Tarwater 26-yard pass to Griffis with about a minute left. Tarwater finished the night completing 20 of 39 passes for 306 yards. He also was pressured and seemingly hit every time he dropped back to throw. Knudsen was mostly bottled up and gained 41 yards on 23 carries. “We didn’t do a good job in run game like we did last week and we didn’t pass protect as good as we needed to win this game,” Franklin said. 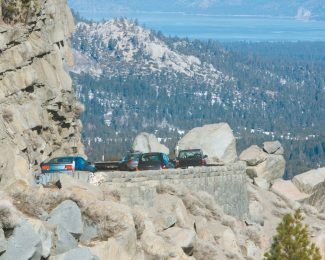 South Tahoe (0-2, 0-1 Northern League) next will go on its first road trip of the season next Friday, Aug. 31, to Sparks (0-2, 0-1 Northern), who fell 35-22 Friday night at Lowry.